Adapted from a recipe by Suzanne Gibbs. Photography and styling by Tanya Zouev. I never used to get terribly excited about Christmas cake or Christmas pudding. Having come from an Eastern European background, the entire concept of a traditional Anglo-Saxon Christmas cake or pudding was completely foreign to me and not to my taste. As a kid I remember being given a piece of fruit cake at a Christmas function and being bitterly disappointed. I decided then and there that it didn’t taste anywhere near as nice as it looked and immediately placed an embargo on it. This continued for a very long time. Over the ensuing thirty odd years my experiences of Christmas cakes and puddings were not much better. I always seemed to be the one who got the dry gritty piece and as for that thick white marzipan icing, what was that about? Was it even edible? Then there was the strange supermarket pudding which came in a tin you had to pry open with a can-opener. My mother occasionally bought it for Christmas and I was staying clear of that one as well. But then an amazing thing happened which changed my mind about Christmas pudding forever. I was on a food shoot for Australian Table magazine (which became BBC Australian Good Food) and we were shooting a pudding for the cover of the Christmas 2006 issue (see pic below). The (then) food editor, Suzanne Gibbs had intended the recipe to be a lighter and more luscious version than its traditional counterpart. I tasted it, it was good, so good in fact I decided to make it that year for my own family Christmas dinner. I was converted. The following recipe has adapted from Suzanne’s. My version is slightly different from hers and the main difference is that it’s gluten-free. The other difference is that I marinate the fruit in alcohol, quite a lot of it, and fruit is my main ingredient. My philosophy is if you’re going to eat Christmas pudding once a year, make it a good one. And if you’re going to add brandy to it then you might as well be able to taste it (and quite possibly feel a bit tiddly afterwards). The final pudding is deeply caramelised from the sugars and fruit and has a uniquely spiced butterscotch flavour. An interesting tidbit of food history is that the Christmas pudding has its origins in medieval England and was originally a dish that had all sorts of leftovers thrown into it. We’re talkin’ vegetables, fruit, even meat. Gradually fruit became the main ingredient as we know it today. The Christmas pudding is sometimes known as plum pudding or plum duff and despite the name, the pudding contains no actual plums. It is in fact a pre-Victorian term for raisins. Prior to the 19th century the pudding was wrapped in cloth and boiled as a round bundle, whereas during the Victorian era it became popular to use a pudding basin when making it. It was also common practice to include silver coins in the pudding mixture, which could be kept by the person whose serving included them. The coins were believed to bring wealth in the coming year. Lastly I’d like to mention that making this Christmas pudding from scratch is so easy. Start the pudding a couple of days before you intend to cook it as you want the fruit to macerate as much as possible. I make the pudding at least a week before Christmas Day, stick it in the fridge and by the time the 25th rolls around the flavours are really well developed. You will be amazed at how easy the process is from beginning to end. 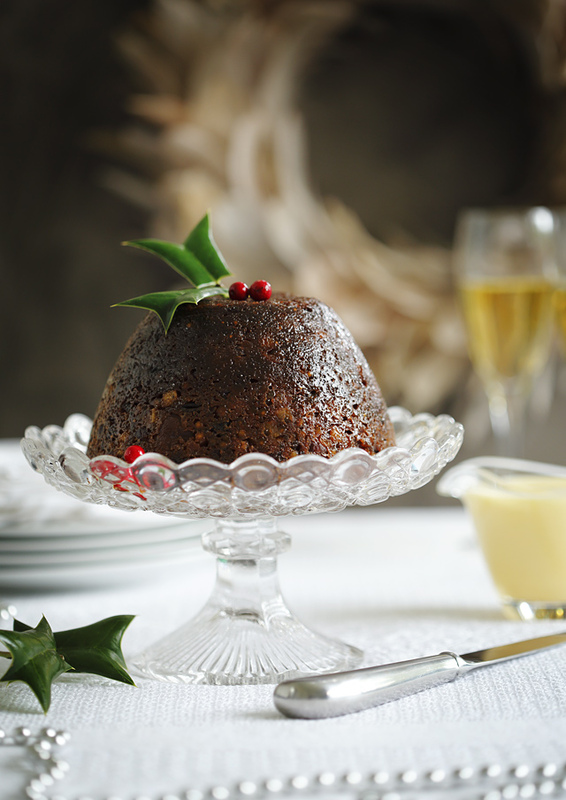 Go on then, wow your family and guests with this Christmas pudding. Whether or not you include silver coins is up to you. Just warn them not to drive after they eat it. Prep time: approximately 1 hour (start the night before), cooking time: 5 and 1/2 hours. Serves 8. 1. Rinse the dried fruit in a sieve under cold running water to ensure there is no grit left in it. If your fruit is candied, there is no need to do this. Leave to drain. Once fruit is drained of excess water place in a mixing bowl and add the alcohol to it. Mix through. Cover and leave in fridge to macerate at least 24 hours. 2. Bring milk to a boil in a small saucepan and pour over sago and mix through thoroughly to ensure none of your sago clumps together. Cover and refrigerate overnight. 3. The next day add bicarbonate of soda and a pinch of salt to the sago mixture, stir through. Then add the remaining ingredients and stir through. If using nuts in your pudding mixture toast your almonds in the oven or on a stove top until they are golden brown, then add and stir through. 4. Butter two four cup pudding basins (or one 8 cup basin). I find pudding basins are quite easy to come by at op-shops, I bought mine years ago at the Salvo’s. Place a circle of buttered baking paper in the bottom of your pudding basins and spoon in pudding mix making sure you pack it down. I always give the pudding basin a few good bangs on the counter to make sure any air bubbles are dislodged. 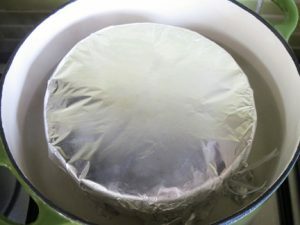 Cover pudding with a circle of buttered baking paper and two sheets of foil and tie with a string. 5. Pour enough water into a large heavy based pan to come ½ way up side of the pudding basin, bring to boil and lower pudding into water. Cover and simmer for four hours checking every 30-45 minutes to make sure the water level stays at the half way mark on the basin. If water has evaporated add some more to the pan. Re-steam for two hours prior to serving. The surface is a beautiful Eastern European vintage linen tablecloth brought by my mum to this country in 1958 when she migrated from China. I was very lucky to receive it as a gift from her some years back. The vintage depression glass comport stand is from Vinnie’s as is the vintage WM Rogers wedding cake knife. My favourite little glass jug from the Salvo’s holds the custard in the background. The dessert plates are by Rosanna, the champagne glasses are by Luigi Bormioli and the feathered wreath was picked up at a car boot sale for five bucks. The only light used in this image is window light. I would like to make this gluten free pudding for Christmas and I have a couple of questions, if you don’t mind. When you mentioned sago, did you mean sago pearls? Or tapioca? For the gluten free breadcrumbs, did your crumbs has xantham gum in it? Yes I meant sago pearls. The gluten free breadcrumbs are simply crumbs made in a food processor from gluten free bread. Whether or not it has xanthan gum in it or not depends on the brand of bread you are using (or if you have baked it yourself). You do not need to add xanthan gum to this recipe as it binds perfectly without it. I am very excited to make this pudding as a gift for friends. Is the extra 2 hours steaming necessary? Or is it just warming it through? I hope this works out – I’m planning on subbing tapioca flour for the sago – don’t have sago where I am. I’m not too concerned, I have a feeling it will be fine. I’ve been sharing this recipe on FB and Pinterest and Twitter…so I hope more GF people find it! Happy Solstice, merry yule..thanks for the recipe. Well, I just put it in the pot to steam! I always end up adjusting everything in any recipe because I just feel like it. My version (and my very 1st attempt) has 3 cups figs, dates, and currants, 3 large eggs, 2/3 cup tapioca flour, 1/3 cup oat flour, 1 cup sorghum flour, 1 1/4 cup brandy, along with 1 tsp cinnamon, 1/4 tsp cloves – everything else is like your recipe. I think that was all the adjustments/experimentation! I will let you know how it turns out, and I would be equally interested in finding out how your almond flour version is. I’m taking my life in my hands this year and I’m messing with a very old family recipe. This year I will have one celiac, two wheat intolerant and one lactose intolerant at my table on Christmas day and would like to cater for all!! Is it the sago that holds the pudd together? My recipe asks for 180g Plain and 1tbs S.R. The size of the Pudding appears similar to yours so I’m hoping I can just replace the flour with sago cooked in water, any thoughts? Could I substitute the GF breadcrumbs for almond meal? Would you be able to reheat in a microwave before serving? ( I know it’s not ideal but may not be able to do it for 2 hours where I am going on xmas day) also can they be frozen? Loved your pudding. My friend is grain intolerant and she made this foe a dinner. Fabulous. Dont need to be grain or gluten free to enjoy this one. In fact I posted a link from the canberra saunas face book page. Hope you do not mind. Just stopping by again to say “Hi” Im making this again this year, and I was so glad I left a comment last year because I never made notes! haha! I hope you are having a happy yule season. This sounds divine – I wonder if coconut oil could be substituted for the butter please? I have been making Christmas puddings for years – my daughter now has an intolerance to gluten so I decided to try your recipe. I will never make my old recipe again! This is the best pudding – from now on my friends get gluten free puddings at Christmas. Really fantastic. Thank you.